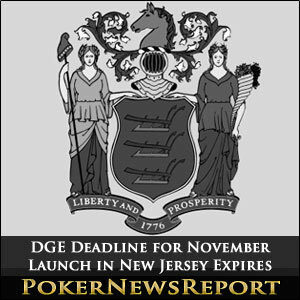 Yesterday marked the deadline for companies to submit license applications to the New Jersey DGE in order to launch online gambling sites in late November. A number of applications made it in under the wire, as those who fail to comply with the July 29 submission date imposed by the Division of Gaming Enforcement are not guaranteed to be among the first-to-market Internet gaming sites. Applications are still being accepted by Garden State gaming regulators, but those tardy beyond yesterday may not be approved in time to go live with their online gaming offerings with the first batch of launched sites. 2UP Gaming PLC, a UK gaming company that has formed a partnership to either purchase an existing Atlantic City casino or build a brand new one, submitted its application prior to the deadline. The British company announced last week that it intends to enter the newly-regulated New Jersey online gambling market. The DGE has not released the names of all applicants who timely filed applications, but several have issued press releases to trumpet their efforts. KGM Gaming was one of those companies who announced their intention to participate in the state’s online gambling scheme. With offices in New Jersey and Philadelphia, KGM submitted its Internet gambling technology to state regulators and reports that it is in discussions with several Atlantic City casinos to provide its remote gaming server to those interested. KGM has devised a Robust Online Client (ROC) that encompasses online gaming options for both desktop and mobile players. MGT Capital Investments also submitted an application in time to be included in the projected November 26 launch date. The company and its subsidiaries typically acquire, develop and monetize various online gambling assets. New Jersey’s 12 casinos have all announced their intentions to offer Internet gambling. It is not known if all will be ready to go live in November. Two of the casinos, the Revel and Atlantic Club, are known to be struggling financially and have not yet named any partners who will provide online gaming software. They may miss the first wave of casinos who roll out online offerings and may also find themselves under new ownership come November.